Sometimes, when things happen to be around us all the time, we tend to take them for granted. Much like the people in our lives, who become invisible to us at times. Wouldn’t it be nicer if we noticed the things and the people a little more often —those who make our lives a little easier, maybe, more meaningful and beautiful too? Wouldn’t it be nice to appreciate them and tell them how much they mean to us? Sharing a tree picture, in our apartment complex that most residents are oblivious to. What do you think of this tree? What a beautiful tree .Its a surprisr your apartment people are oblivious to it. Much thanks, Amrita. 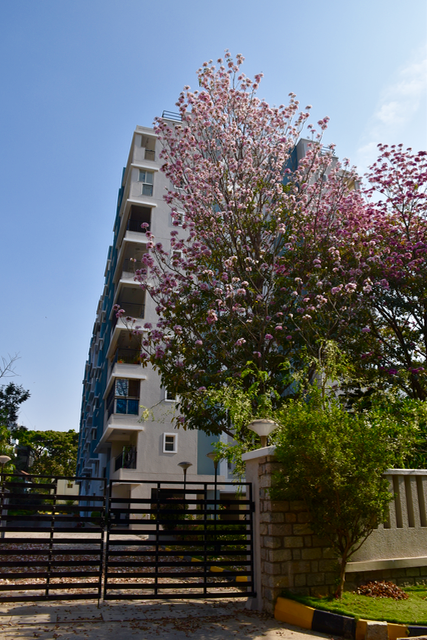 It’s true when people walk past this and other beautiful trees even in the flowering season, even when the branches are laden with pretty blossoms such as this, they never seem to notice this tree! I have shared a similar thought in today’s post for Skywatch and TTL. I don’t need to mention my thoughts here since I have already shared on my blog, Esha! This is a Cassia Tree, typical to Bangalore and one that flowers twice a year! This bloom is from Mar/Apr this year when the flowering season had just begun. I’d also love to know what this is. It would never be invisible to me, I promise. So majestic! Majestic it is, Alana. This is a Cassia tree that is typical to our city Bangalore. In early spring they bloom everywhere and the riot of pink takes over the city’s nooks and corners but they stay only for a week or two. They gradually pale and turn almost white before they wither away and fall. What a gorgeous tree and couldn’t agree more to the thought that you shared. The moment we start noticing, things get clearer and we realize the importance too. Thank you for joining Esha with this thought that serves has a reminder to all of us. The tree not to forget is beautiful. Very true – its so easy to caught up with our daily routine and forget to live in the moment and notice those around us and also the nature that surrounds us…. gratitude takes nothing for granted. The tree adds beauty to the apartment.